My MSc Open Data Impacts was a mixed-model study, combining qualitative data collection and analysis with survey data. 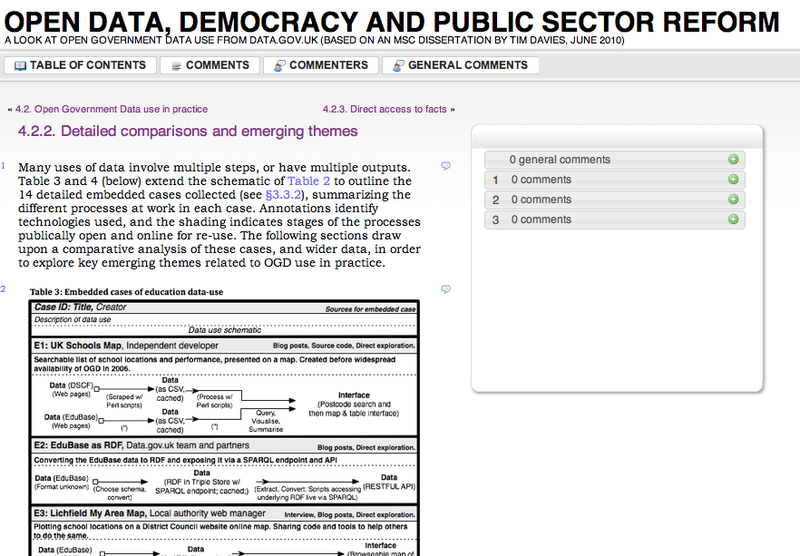 As part of the research an online survey was available between May 11th and June 14th 2010.
Who is using OGD? Evidence for §4.1 of dissertation write-up. Respondents were necessarily self-selecting. 72 full responses to the survey were received. The survey was carried out using LimeSurvey 1.87+ Build 8518. You can find a PDF of the full question list for download here. You can find a LimeSurvey export file in CSV format here. This should import into LimeSurvey 1.87+ to allow repetition of the survey in other contexts, or to support the extraction of specific questions for re-use in other contexts. If you are planning to make any use of this, do get in touch – as I’ve not yet documented all the learning from using these questions – and some would benefit from considerable modification for future use. Look for posts tagged ‘survey’ on the blog for any analysis of the survey data. Analysis is predominantly being carried out using the open source R statistical software, and if practically possible I will try to post details of any R scripts used during the analysis of the data.